It’s the definition of insane: Doing the same thing over and over again and expecting a different result. 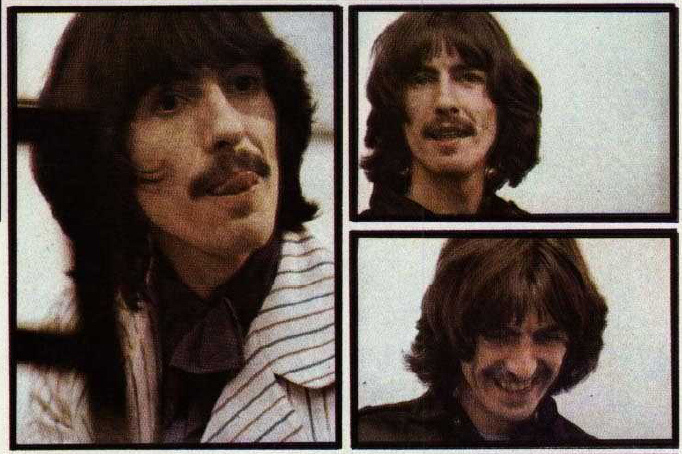 God bless George Harrison, but at times during his tenure with the Beatles I think he was insane. (It’s likely I’m an insane blogger, who feels like he’s writing the same post about George over and over again). To wit: Every album session, George throws a number of songs at the wall (the wall also goes by the names of “John” and “Paul”), sees a couple stick for whatever the current record is and reintroduces a couple of the losers along with some new songs again some other time. Repeat until going solo. Jan. 6 saw a pair of fresh George tunes, “For You Blue” (which stuck) and “Hear Me Lord” (which did not). Neither was given any significant time. And “Hear Me Lord” wasn’t to be heard again in these sessions or even in a Beatles context, far as I can tell. Perhaps he finally figured out he was going insane. Or maybe there was divine intervention. “Well, I wrote a gospel song over the weekend, lads,” George says in a lull. “According to St. Who?,” Ringo blithely asks. “According to the Lord,” George replies. “Hear me Lord, how I corner you,” to laughter. (At least that last bit sounded like that, it’s almost indecipherable). A second of silence was followed with Michael Lindsay-Hogg going right into business, suggesting the band discuss the live show soon. George first touches on “High School Confidential,” then he plays and sings along to “I’ve Got a Feeling” before pivoting right into his new song. You could hear it in the clip — George is playing background music. As he played, Paul, Ringo and Michael Lindsay-Hogg discussed “the new Bonzo’s record,” — presumably The Doughnut in Granny’s Greenhouse, which had come out in November, a few weeks earlier. Soon, the strumming ended and conversation returned to the Cream discussion. While Paul and Michael continue to chat about some equipment issues, George resumes on his guitar, now debuting “For You Blue,” an eventual survivor on the Let it Be LP. Again, it’s background music. Soon enough, the band — fully ready to play, finally, as John takes to the organ — cuts away, weaving into oldies, improvisations and rehearsing newer songs (topics ripe for subsequent posts). Nearly an hour and a half after he first strummed it (on the tapes), George returns to “Hear Me Lord.” Again, it’s primarily a quiet soundtrack to other discussions, among them one in which we finally hear another George — Martin — a figure so absent from the Let it Be tale, here showing up for the first significant time on tape. Ringo plays a bit of a beat, and John makes a terrible attempt at following along on guitar. It’s more of the same after extensive rehearsals of “Two of Us” and “Don’t Let Me Down,” among others. Again, it’s just a quick taste before they moved on. Indifference isn’t strong enough a term for how the song is met. I suppose George could have pressed it a little further as an option. And that was it for the song. No more rehearsals during the Get Back sessions. If it was brought up during the “Abbey Road” recordings, there’s no record of it I’ve seen. And we wouldn’t hear it again until we get to the last song on Side 4 of the All Things Must Pass LP, released nearly a year after George first brought it to the Beatles. Maybe Hear Me Lord was just a dull song. Maybe they were tired of George’s constant religious chatter — like I get whenever I’m seated next to my sister-in-law who manages to turn every conversation into a religious chat. You just want to tell her, “Shut up already.” Why is it so hard to imagine that John and Paul found it boring to be around a religious nut? George would have the last laugh on “Abbey Road” ! “Something” and “Here Comes The Sun” stand with ANY Beatles’ song ever written. And John, at least, give him full credit. Said they were the two best songs on the album. Where are the posts?? Stop watching the 2012 London Olympics and tell me what the Fabs were doing in London in January 1969!! Taking a summer break, Dan? Come back and entertain us with more great LIB posts! Hope all is well. Thanks as always for the concern! I disagree that it was a boring song. I think maybe Paul had “Let It Be” also in the back of his head and possibly didn’t want two quasi-religious songs on rotation for the “Get Back” project. More likely though is that they just rejected George’s output out of sheet habit. I think George may have played them without any energy or enthusiasm (he seemed to have a lit of energy for Bob Dylan’s tunes) but there was nothing wrong with his songs per se as far as I’m concerned.